Brought to you by Front, the inbox for productive teams. Shopify, HubSpot, and more than 4,500 teams worldwide are giving better customer service with our collaborative inbox app. One Zappos customer service employee sent flowers to a woman who ordered six different pairs of shoes because her feet had been damaged by harsh medical treatments. Another spent 10 hours on the phone with a customer before helping them with a shoe purchase. Another overnighted a free pair of shoes to a best man who had arrived at a wedding shoeless. These are just three of the dozens of stories that surface on the web every year about the e-commerce shoe company that seems to do customer service better than anyone else in the world. Every experience is unique, yet every experience is top notch. What’s even more surprising is that reps at Zappos don’t follow any kind of internal protocol about how to work with customers. There’s no Zappos policy about spending a minimum amount of time on calls or a requirement to follow up with customers who are unwell. The reps provide excellent service because they’re equipped with the skills to determine the best approach for each customer. How did they build such a stellar team? Zappos’ secret begins with their hiring process. When hiring customer service reps, they put each applicant through an intensive screening process to ensure they have the skills to be fast-moving, empathetic decision-makers later down the line. They search for talent that possess the foundational skills to become excellent reps and provide a best-in-class experience for any kind of customer. Laszlo Bock, Senior VP of People Ops at Google, warns managers about the biases that lead to bad hiring decisions. He says that because most interviews are unstructured, people are highly susceptible to letting first impressions dictate their decisions — they make up their mind immediately and spend the rest of each interview trying to justify it. 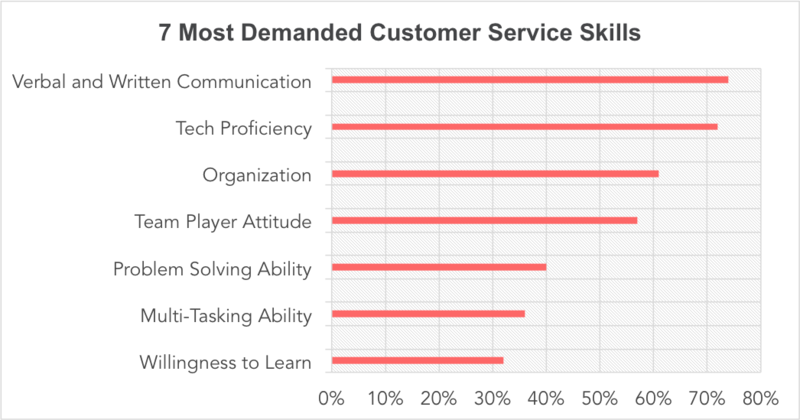 To combat this natural tendency, you need a uniform, structured strategy for gauging each of the customer service skills you’re looking for. Prepare a list of questions to evaluate each skill (here's a list of skills for live chat), so that you can determine the best applicant for the job without giving in to your own biases. Unsurprisingly, verbal and written communication skills are the most frequently requested: 74% of job ads listed them as invaluable. Written communication skills are crucial for customer service teams where reps work with customers primarily over email, SMS, or chat. Even on teams where most customer interactions happen on the phone, employees are still responsible for writing documentation and communicating with other teams to resolve issues. Specific. Make sure it’s not a generic letter, but instead is written specifically for the position at your company. It shouldn’t just mention your company’s name — it should provide compelling reasons why they’d be a fit for the role in your organization. Well-structured. It should have an intro with a thesis that briefly explains why the applicant would be a great fit, a body paragraph that dives into their relevant experience, and a conclusion that ties the piece up nicely. Supplementary to their resume. Their cover letter should not rehash everything on their resume in paragraph form. It should provide concrete evidence of the skills you’re looking for. If their cover letter passes the test, you can gauge their verbal communication skills during the interview. Ask questions that require open-ended answers, so that you can look for clarity of thought in how they present their arguments. Are they answering your questions succinctly, with the most relevant information first, or do they ramble before they get to the point? Also, do they ask clarifying questions back before giving you the best possible answer? Overloaded with support requests? Learn how to master high-volume support in our webinar with TalkDesk: 5 ways to master high volume support. The second most in-demand skill reveals an interesting trend. The majority of companies — regardless of vertical — required tech proficiency in common software from their reps. As this Apple job ad mentioned, candidates should have the “flexibility to regularly rotate through different technical specialties and skill sets” and the “ability to thrive on change as products evolve”. When you’re gauging tech proficiency, don’t look for experience with the tools your team already uses. The customer service environment is constantly changing — with new technology released every year, teams are always expanding to new channels and leveraging new tools. Experience with specific software becomes irrelevant, fast. Building or maintaining a website. An easy way to hone technical skills is to build a website. If they’ve put together a website for blogging or selling products online, it’s a sign they’re self-motivated to take on technical challenges. 61% of the job ads mentioned organization as an important quality in their applicants. Since employees will be expected to handle dozens of emails a day (if not more), they need to be organized and process-oriented to ensure they follow up on every message. Ask candidates about past projects, and look for signs that they came up with clear strategies and executed on them. It could be as simple as a creating deadline calendar for a research group or student publication, or as sophisticated as resolving a complex logistics problem at a transportation company. Answer the specific question that’s asked, rather than talk about the general topic of the question. If you ask about their role in a successful team project, they should answer with their specific responsibilities and not just a general description of the project. Give structured answers, presenting anecdotal evidence of their past experiences in a way that’s easy to follow. They don’t randomly give details about a project ranging in relevance in scope, but rather guide you through their narrative with clear transitions and higher level explanations. Ask probing questions, instead of asking a series of prepared questions. Organized candidates will ask questions that build on each other, based on your answers, to give them a comprehensive understanding of their role within the company. 57% of the job ads said they were looking for applicants who worked well in a team. While most hiring managers look for this skill, the ability to work productively with others is relatively rare. According to an HBR study of more than two decades of data, 20-35% of collaborative output comes from less than 5% of employees. J. Richard Hackman, a psychologist who’s spent 40 years studying teams in the workplace, discovered that one of the biggest detriments to teamwork is found in “us versus them” thinking. Only if a team takes on a shared mindset will they succeed together. Ability to work with peers and managers. Look for signs of camaraderie with former peers by asking questions such as “Can you run me through a group project that you played a critical role in?” You want employees who can be trusted by both teammates and managers to do their share of high-quality work. Ability to assume a leadership position when necessary. A great team player does their part to be helpful however they can, which includes stepping up to the plate to lead when needed. Ask about previous leadership experience—even if it’s unofficial— and ask candidates to explain how they found themselves in that position. Being able to solve customer issues quickly and effectively is critical to the success of a customer service rep. 40% of the job ads asked for problem-solving or critical thinking skills. According to Laszlo Block, a work sample test is the best predictor of success on the job. If possible, give candidates real-life customer problems to work out during your interview. Ask them to walk you through their thought process, or set aside time for them to work on a problem on your own before reviewing it together. The specificity of their answers. When you ask candidates about their qualifications, they should be able to provide company-specific answers. They should be able to fluently work in details about your company philosophy, competitors, or potential challenges. The questions they ask. They shouldn’t ask for information that’s readily available on your website or in the job description — that information should serve as a jumping off point for more detailed questions. Cisco Meraki, Boostability, and thousands of other teams are using Front to give better customer support. Try Front free. Support reps are responsible for hundreds or even thousands of customers, depending on the company. Some of their questions will be quick and easy to resolve, and others will require substantial effort. To succeed in such a role, they need to be able to multi-task under pressure and not let any message slip through the cracks. Yet multi-tasking is somewhat of a misnomer. Someone who effectively multi-tasks isn’t doing several things at once— in fact, studies have shown that makes people incredibly unproductive. Ironically, being good at multi-tasking means that you have the ability to stay focused on one task at a time, despite having numerous responsibilities on your plate. Prioritizing. See if they have a method for evaluating the urgency of the projects that they take on by asking questions like, “If you receive three customer questions at once, how do you decide which you will work on first?” You want to see a “get-it-done” attitude that indicates that this person won’t put difficult work on the back-burner. Deadline setting. 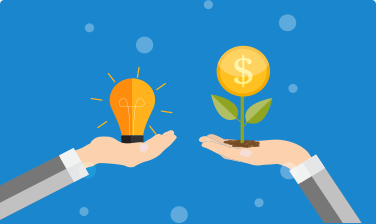 See whether they give themselves a buffer for getting work done, by asking questions such as “How do you decide whether you have the bandwidth to take on a project on top of your existing workload?” It’s better to take on someone that can realistically scope projects, rather than misinform and disappoint customers. The customer service team environment is constantly changing. With new technology being released year after year, teams are constantly expanding to new channels and tightening their processes for faster response times. Nearly one-third of job ads require a “willingness to learn,” so that all their team members are prepared for an ever-changing work environment. Buffer’s Kevan Lee has pointed out that employees are better at their jobs when they’re given time to pursue other creative interests — hence Google’s 20% policy that lets employees spend part of their days pursuing personal projects. The ability to stick with projects and gain mastery over a hobby that goes well past basic proficiency — it’s an indicator that the person doesn’t need managerial overhead to push themselves and stay engaged in their work. The ability to learn independently without a structured course or tutor — it’s an indicator that they’re intrinsically motivated to improve themselves. Hiring? Check out our guide to hiring the best customer service representatives. A recent New York Times article has declared job interviews “utterly useless.” The author, Jason Dana of the Yale School of Management, reveals his research which shows that the majority of interviewers overestimate their ability to assess applicants’ qualifications. They overlook critical data and jump to conclusions based on narratives that are only partially based on fact. While most hiring managers give job descriptions a considerable amount of thought, their hiring practices often fall short. Interviewers don’t develop a screening process surrounding that very same criteria that they laid out in their postings. Use these 7 skills as more than just job description copy. Build a structured screening and interview process around the most in-demand skills to ensure that you hire the best people for the job.